New Delhi: The government on Friday announced the launch of its second exchange-traded fund (ETF), Bharat 22, which will comprise 22 stocks including those of central public sector enterprises (CPSEs), public sector banks and its holdings under the Specified Undertaking of Unit Trust of India (SUUTI). Finance minister Arun Jaitley said the ETF will have a diversified portfolio of companies from six sectors with a 20% cap on each sector and a 15% cap on each stock. “While selecting each of these sectors, we have kept in mind sectoral reforms which have had direct impact on the valuation of these shares... We believe that this ETF will be a fairly successful one," Jaitley said. Exchange-traded funds (ETFs) are essentially index funds that are listed and traded on exchanges like stocks. An ETF is a basket of stocks with assigned weights that reflects the composition of an index. Through the first CPSE ETF launched in March 2014 and currently managed by Reliance Capital Ltd, the government raised Rs8,500 crore, selling in three tranches. 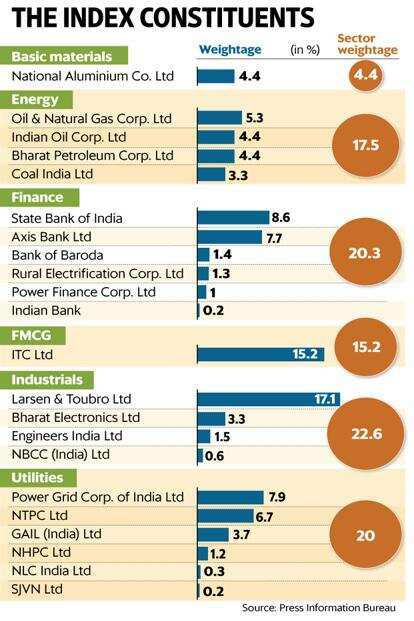 It consisted of stocks of 10 public sector entities—Oil and Natural Gas Corp. Ltd (ONGC), Coal India Ltd, Indian Oil Corp. Ltd (IOC), GAIL (India) Ltd, Oil India Ltd, Power Finance Corp. Ltd (PFC), Bharat Electronics Ltd (BEL), Rural Electrification Corp. Ltd(REC), Engineers India Ltd and Container Corporation of India Ltd. The government holds an 11.17% stake in ITC Ltd, 8.16% in Larsen & Toubro Ltd (L&T) and 11.53% in Axis Bank Ltd through SUUTI, an offshoot of the erstwhile state-run investment firm Unit Trust of India. Neeraj Gupta, secretary of Department of Investment and Public Asset Management (DIPAM), did not reveal how much the government is targeting to raise through the new ETF or the timing of its launch. ICICI Prudential has been appointed as the fund manager of the new ETF. The stocks included in the ETF are National Aluminium Co. Ltd from basic materials; ONGC, IOC, Bharat Petroleum Corp. Ltd, and Coal India from the energy sector; State Bank of India, Axis Bank, Bank of Baroda, REC, PFC and Indian Bank from the finance sector; L&T, BEL, Engineers India Ltd and NBCC (India) Ltd from the industrials sector; ITC from the packaged consumer goods sector; Power Grid Corp. of India Ltd, NTPC Ltd, GAIL India, NHPC Ltd, NLC India Ltd, and SJVN Ltd from utilities. Prithvi Haldea, founder-chairman of Prime Database, which tracks equities, said it is a good idea to include SUUTI stocks in the ETF as the stocks are performing well. “Government may have included the public sector bank stocks to get a better valuation out of them," he added. Jaitley said sale of public sector bank stocks through the ETF was not inconsistent with the government’s policy of banking sector consolidation. “Present law permits us to bring down government equity in PSBs to 52%," he added. The government has set a “stiff target" of Rs72,500 crore for disinvestment in 2017-18 and has so far garnered Rs9,300 crore. The initial public offering of state-run shipbuilder Cochin Shipyard Ltd was subscribed 76.1 times on Thursday, the final day of the public offering. Jaitley said ETF is a successful experiment globally with assets under management (AUM) of $4 trillion. Over four years, AUM is expected to touch $7 trillion as sovereign and pension funds have started preferring the ETF mode, the finance minister said.